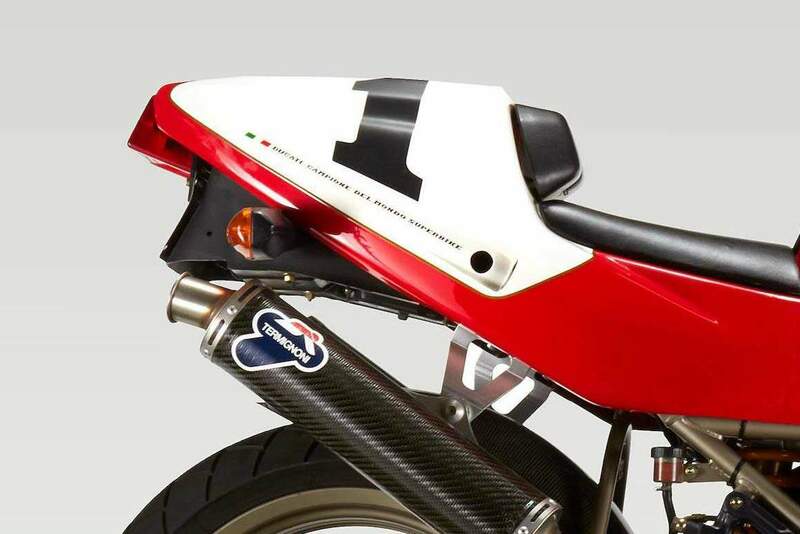 As the official factory racers and the Sport Production series were already displacing 888cc, it was inevitable that the production Superbike Strada would follow suit. This occurred for 1993, with the series also becoming a generic "888" rather than "851." The 888 also featured Pierre Terblanche's 851 styling facelift of 1992. 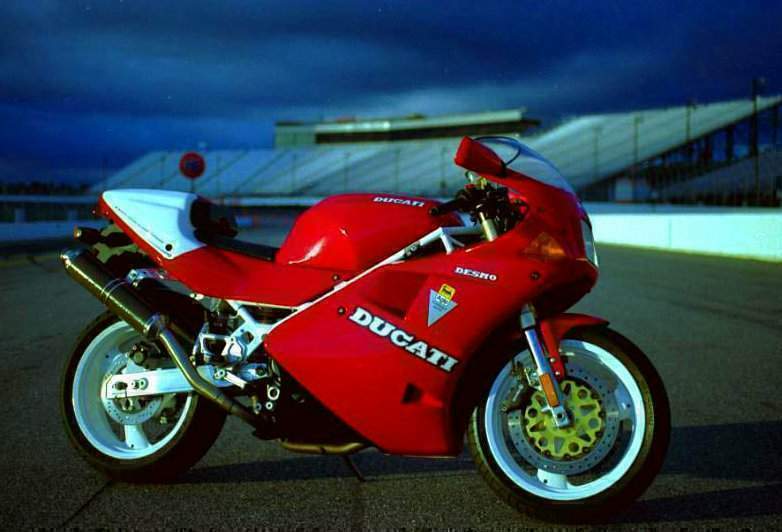 The European 888 Strada was very similar to that of the 1992 851 Strada and, except for an 888cc engine, most of the specifications were shared. They had the same valves, camshafts gearbox, and a single fuel injector per cylinder. To set the 1994 versions apart from the almost identical 1993 model there were new decals.The final 888s also featuring bronze-painted wheels. 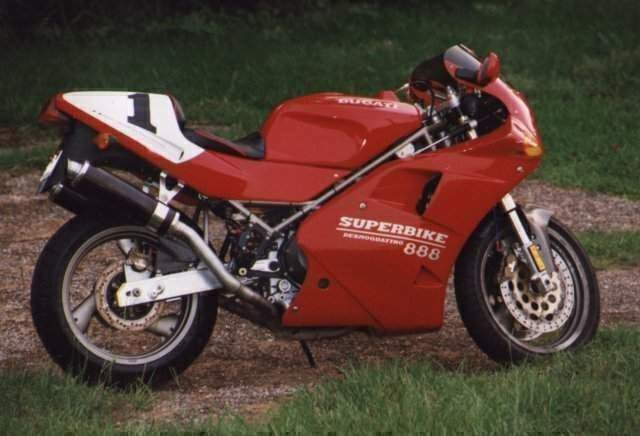 The 888 was sold as the 888 SPO in the U.S. market, an amalgam of the limited production high-performance SP5,and the European-specification 888 Strada. As the SP5 was unable to pass U.S. DOT requirements for registration, the SPO was created to homologate the 888 for AMA Superbike competition. 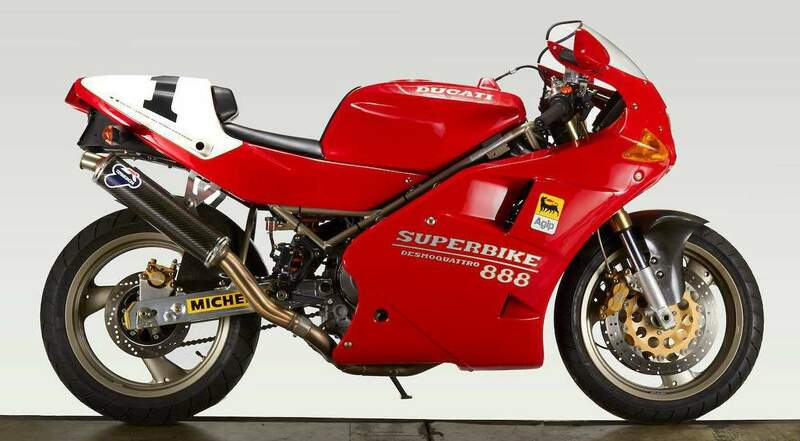 While they were titled a Sport Production, they were more closely related to the 888 Strada than the SP5. The SPO engine was identical to that of the 888 Strada, but many chassis components were shared with the SP5.The stainless-steel front discs and Showa fork were shared with the 888 Strada, but the SPO had a single seat, upswept exhaust pipes, and an Öhlins shock absorber with eccentric ride height adjustment. Even though it was a Monoposto, there wasn't an aluminum rear subframe as on other Sport Production models. There were only detail changes for the 1994 Model Year. Updates included a carbon fiber front fender, bronze wheels, a larger-diameter front axle, and a numbered plaque on the top triple clamp. 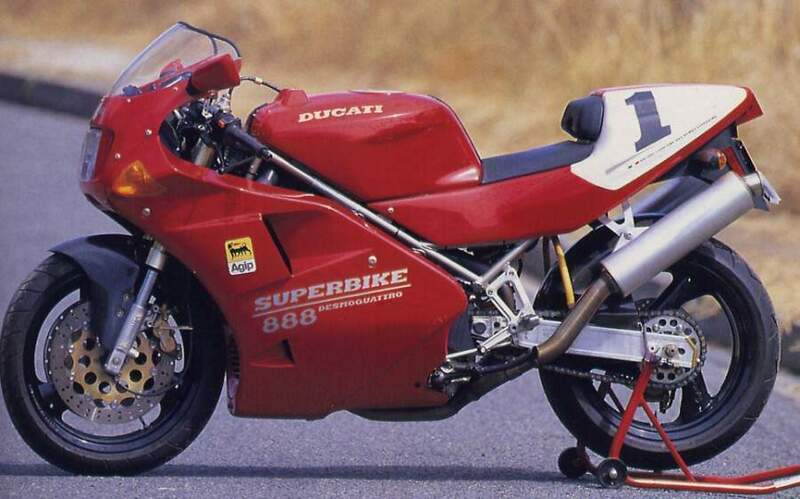 Although overshadowed by the 916, the 888 was a well-developed, and largely underappreciated, model.. IT HAS ALWAYS BEEN EASY TO FALL IN LOVE WITH THE bikes of Italy. They're all about excitement and emotion. Unfortunately, too many times in the past enthusiasm for Italian motorcycles has needed excuses. Excuses for inadequate reliability, paltry performance, inferior build quality, crude carburation, evil electrics, shoddy suspension. 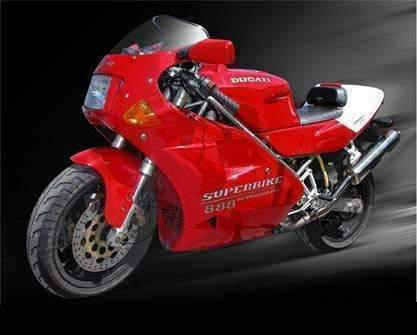 Those days have been over for some time, and Italy's two top-line sportbikes-the Ducati 888 SPO Superbike and the Moto Guzzi Daytona 1000-are further proof of that. Both bikes have hefty doses of racing heritage. 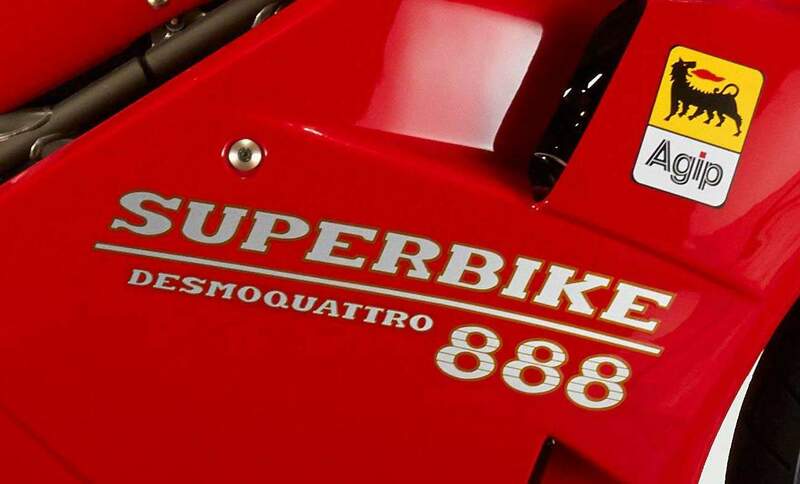 The new 888 SPO (the initials stand for Sport Production Omologato) is a diredt descendant of the company's 851 Superbike, a machine with a trio of World Superbike titles to its credit in the capable hands of Frenchman Raymond Roche and American Doug Polen. Because it is mostly an all-new machine, the Moto Guzzi hasn't yet had a chance to prove its on-track mettle, though many of its design and engineering elements were pioneered and developed successfully on the racetrack by American Dr. John Wittner and rider Doug Brauneck, who together won the 1987 AMA Pro-Twins championship aboard a specially modified LeMans-based Guzzi. Wittner went on to become heavily involved in the new Daytona streetbike's development, and is currently at work in Italy on a racing version. Though they're both red, both Italian and both V-Twin-powered, the 888 and Daytona 1000 are very different motorcycles, a fact that becomes clear the instant you climb into their solo-saddle cockpits. The 888 has the short, light and cramped feel of a racer, which, in reality, is exactly what it is. The front wheel seems as if it's wired directly to the clip-ons. There's no extra fat on the bike-just enough hardware to get the job done, a job that entails sucking up long straightaways and straightening bends as quickly and effortlessly as possible. The Guzzi, on the other hand, is a bit less hard-edged than the track-oriented Duck, a bit more traditional in terms of design and layout. Like past Guzzis, the Daytona is (and feels like) a long motorcycle, with a wheelbase measuring 57.5 inches, 2 inches longer than that of the Ducati. Though its fairing and body are newly designed, reaching for the Daytona's clip-ons, lifting your feet onto its footpegs and gazing down at the cylinders jutting from either side of the bike is not unlike settling into the saddle of a lOOOcc LeMans. As Wittner himself explained, "The Daytona is a long-legged sportbike in the tradition of the LeMans, but much more powerful." Thumb the "choke" lever of each bike, jab the starter buttons, and both start quickly, their Weber-Marelli fuel-injection systems delivering the precise amount of fuel/air mixture to each combustion chamber. The Daytona requires a few seconds of cranking before it lights; the 888 fires almost instantly. Both are ready to ride within seconds without any surge or stalling; not advisable, yet a tribute to the fuel injection just the same. Both also offer excellent throttle response, and the muffled bark emanating from each bike's exhaust system is as soul-stirring as anything this side of the Daytona paddock during Cycle Week. . The Daytona is like Guzzis of old in more ways than simply its long wheelbase; there's also the characteristic pull to the right whenever the throttle is blipped, the result of its longitudinally mounted engine and its spinning flywheel mass. Control feel on both bikes is crisp, the Daytona getting the nod here due to switchgear that works almost as nicely as that of, say, a Honda CBR600. Clutch engagement, especially on the Ducati, is smooth and free of squeals and slippage, a surprise to those of us used to the grabby clutches fitted to previous Ducatis. Once underway, the Daytona feels roomier and more comfortable. Compared to the 888, the Daytona has an inch more seat-to-peg distance, and considerably more space between the rear of the fuel tank and the solo seat's back pad. The 888 offers more seat-to-bar room, though its high-mounted footpegs and limited seat area are truly cramped for those of larger-than-average size. Around town, the Guzzi is a bit easier to get along with than the 888, which offers a taut ride, frustratingly little steering lock and next-to-useless mirrors. In addition to its slightly higher level of comfort, the Daytona makes more low-end power, offers an easier-to-fmd neutral, and has mirrors that provide a nice-if sometimes buzzy-view to the rear. There's also plenty of steering lock, and its suspension offers a more compliant ride than the 888's. Wind protection is a toss-up, as is engine vibration, at least in the lower end of the rev range; on top, the 888 is buzzier. That engine, a 90-degree, dohc, liquid-cooled V-Twin with desmodromic valve actuation, eight valves and six speeds, produced 94 horsepower and 59.4 foot-pounds of torque at the rear wheel on the Cycle World dynamometer. Those numbers don't make the 888 a horsepower king, though they're good enough to propel the 449-pound bike to a top speed of 152 mph-some 7 mph slower than the CBR900RR Honda, but 1 mph quicker than the '93 Suzuki GSX-R750. At the dragstrip, the 888 was hampered by its short, wheelie-prone wheelbase, though it still posted a respectable quarter-mile performance of 11.25 seconds at 123.4 mph. Again, that's 750-class territory. The Daytona engine, which shares only a crankshaft and crankcases with the old-style Guzzi V-Twin, displaces 992cc through a smaller bore and a longer stroke than the 888 powerplant's. 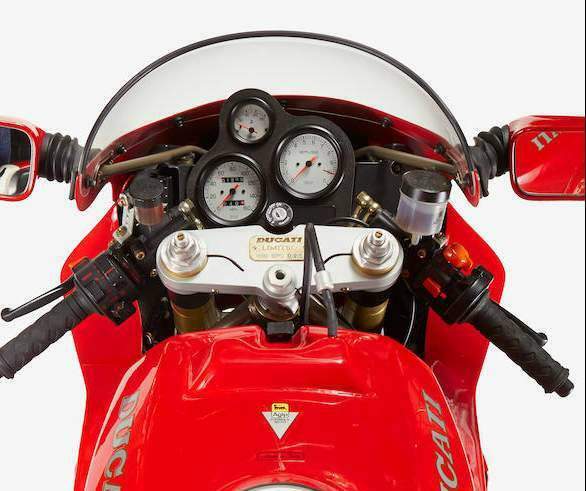 Like the Ducati motor, the Guzzi engine uses four valves per cylinder, though rather than the 888's dohc arrangement, the Daytona engine uses a "cam-in-head" design that places each belt-driven cam inboard of the intake ports, and connects the rocker arms and cams with short pushrods. Air-not water-is the engine's cooling medium. The rest of the five-speed engine is straightforward in design. Compression is 10.0:1, the valves have threaded adjusters, and ignition is provided by Weber-Marelli. As expected, the Daytona's performance numbers weren't up to those of the hell-strong 888, though they were much better than those developed by previous Guzzis. The Daytona pumped out 84 rear-wheel horsepower, 11 more than the modified Rennsport LeMans we tested back in January, and significantly more than a stocker. The Daytona posted a top speed of 136 mph, and ran a best quarter-mile of 12.19 seconds at 113.6 mph. Those numbers put the Daytona just behind current 600-class sport-bikes, though there's more to the Guzzi engine than meets the stopwatch. It may make 10 fewer ponies than the 888, but the Daytona pumps out almost 3 foot-pounds more torque, and at lower rpm to boot. The result is excellent ridability, with big-time low-end and midrange power available whenever you open the throttle. The Ducati 888 also makes solid power in the lower portion of its rev band, but you've got to spin it to achieve serious velocity. Just as their engines and power outputs are different, so too are the handling characteristics of each machine. The 888 is clearly the racebike of the duo, with its short wheelbase, racer-width wheels, taut, highly damped suspension components and birdcage chrome-moly frame. The Daytona is less track-ready, more of a traditionalist's GT-class machine, a bike that operates on the same level of sporting intent as a ZX-11 Kawasaki or a Honda CBR1000F, its low clip-ons notwithstanding. The Guzzi's frame is especially trick, the same basic design found on Winner's championship bike. "The Daytona's frame and swingarm are 1.5mm chrome-moly tubing," Wittner says, "just like the racebike." For backroad use, especially when higher speeds are involved, the 888 is an awesome tool, one that slices and dices in a manner few motorcycles can match. Smooth roads are the bike's favorite playground, where its rocksteady high-speed stability, stiff suspension, massive cornering clearance and confidence-inspiring steering make the rider feel like he can do no wrong. There are no wobbles, shakes or shimmies, just monster motor and a chassis that seems to dare you to turn up the heat even more. As good as it is on smooth roads, the 888 has some trouble with bumpier sections of tarmac, trouble that can be traced directly to the bike's suspension settings. Pavement dips that would normally be sucked up by a softer suspension are transmitted to the chassis, causing a degree of instability. This never feeds on itself or threatens to throw a rider off, but it takes some getting used to. We minimized the trait somewhat by softening the shock's preload setting. Braking from the trio of Brembo discs is superb, with progressive power and good lever feel. 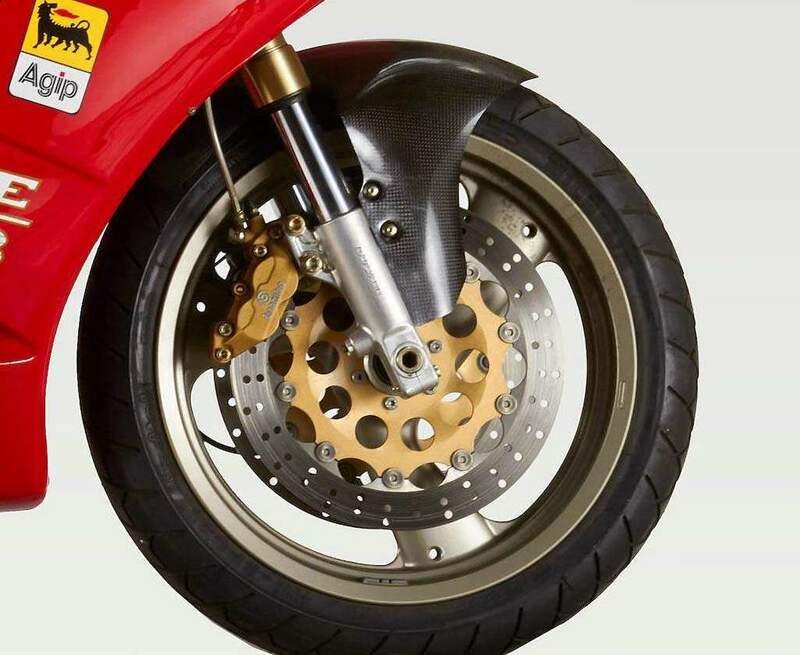 The same brake system is also found on the Daytona, which, due to its longer, more stable wheelbase, braided-steel lines and slightly better lever feel, posted better stopping numbers. Grip on the Ducati is supplied by Michelin Hi-Sport radials in 120/70 and 180/55 widths. They stick superbly, but don't expect them to last too long if you ride the bike the way it likes to be ridden. The Daytona uses the same skins, with a narrower, 160/60 example in back. 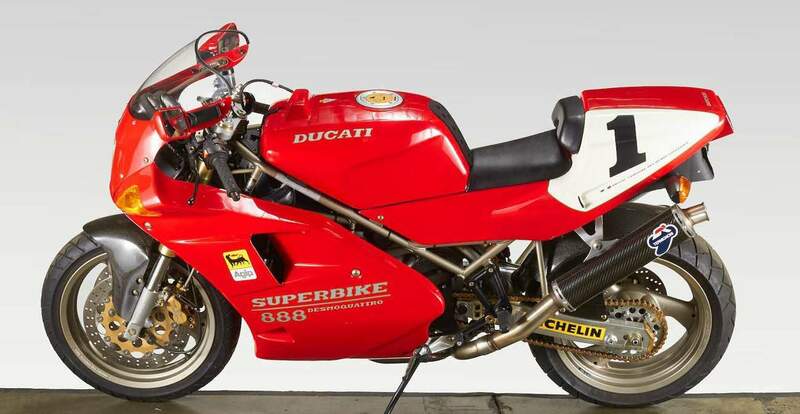 The 888 is one of those rare motorcycles whose limits are so high that you'd be foolish to try to get near them on the street. What else would you expect from a bike with three world titles? The Guzzi is an altogether different animal. Its limits are lower than those of the 888, but it's easier to jump aboard and immediately ride quickly. The 888 can be tough to figure out and demanding to ride at speed due to its cramped riding position and taut suspension. The Daytona shines by excelling everywhere and not doing anything wrong. Its suspension offers a good balance of compliance and control. Steering effort is relatively light, a bit better than that of the 888, though the bike does turn more readily to the right at slower speeds thanks to the engine's pull-to-the-right flywheel effect. At serious velocities, the Daytona proved unflappable, with well-damped suspension, plenty of cornering clearance, premium tires and, a relatively flickable, yet very stable nature despite its 502-pound dry weight. Due to the bike's floating rear gearcase, the effects of the Daytona's shaft drive are almost nil, and mid-corner throttle changes have almost no consequence whatsoever on the chassis. If anything whacking open the throttle while leaned over make the rear end squat slightly, just like a chain-drive bike. What we've got here, then, are two very different motorcycles with a lot in common. One, the Ducati, is a Superbike racer traveling incognito, with a headlight and turnsignals included to keep the Department of Transportation happy. It is among the very best sportbikes in the world, regardless of engine type, regardless of country of origin. The other, the Guzzi, is a polished and thoroughly updated version of a machine many had left for dead. It probably won't ever win a world roadracing championship, but there is no more charismatic motorcycle on the market today. Both the 888 and the Daytona are expensive. Both are exclusive. Both are exciting. Both speak to the emotions. And both are very easy to fall in love with.